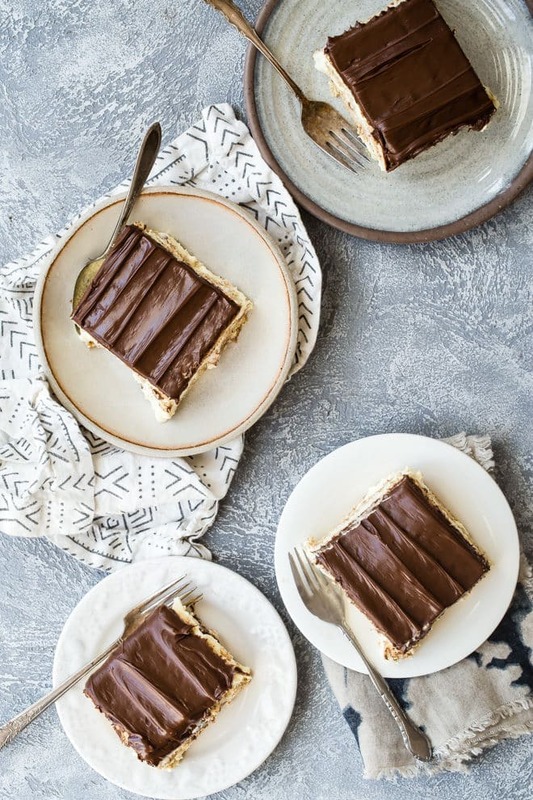 This no-bake easy chocolate eclair cake is the recipe my mom used to make, and one of my family’s favorites. 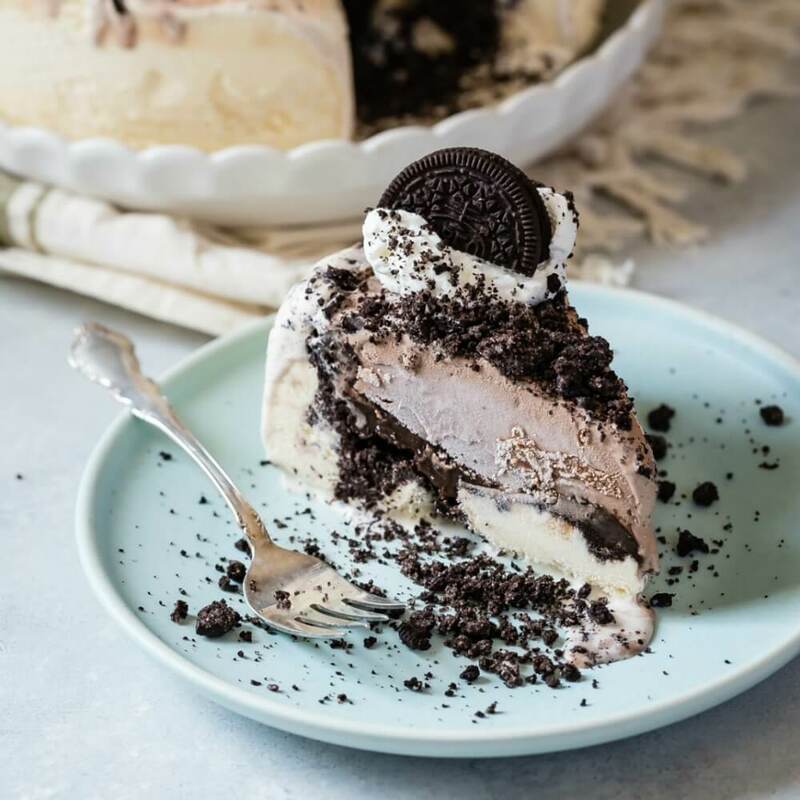 Inspired by the chocolate eclair cake Portillo’s serves, it comes together in about ten minutes—all you have to do is make it the day before you need it, put it down on the table with some forks, and get out of the way. This cake used to be one of the most popular desserts at the potlucks of my childhood, so I thought it deserved a revisit. You don’t have to be a baker to layer graham crackers with pudding and whipped topping, and then slather everything in rich chocolate frosting. 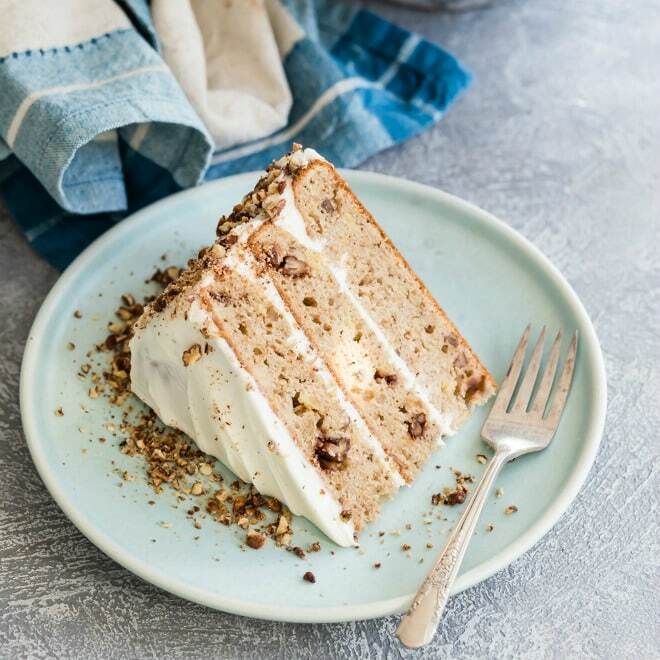 Overnight, the refrigerator does all the hard work for you, softening those layers into a perfectly sweet, creamy, chocolatey cake that tastes like you worked much harder than you did. Need to make a double or triple batch for a wild party? Click and slide the number next to “servings” on the recipe card below to adjust the ingredients to match how many you’re feeding—the recipe does the math for you, it’s that easy. What is Chocolate Eclair Cake? It’s an old fashioned sheet cake that requires no baking and is reminiscent of a chocolate coated, creamy eclair. Made for generations, it uses graham crackers, pudding, whipped topping, and your favorite chocolate frosting. This is just a guide to how you assemble it. The full recipe is at the bottom of the post. In a bowl, mix the pudding and milk together until smooth. Then, gently fold in the whipped topping. Alternate layers of graham crackers and pudding mixture in a baking dish. Top with chocolate frosting. Chill. Can you make Chocolate Eclair Cake without cool whip? This recipe is definitely not from scratch, but if you would rather use whipped cream folded in to the pudding instead of the topping, that is absolutely fine. 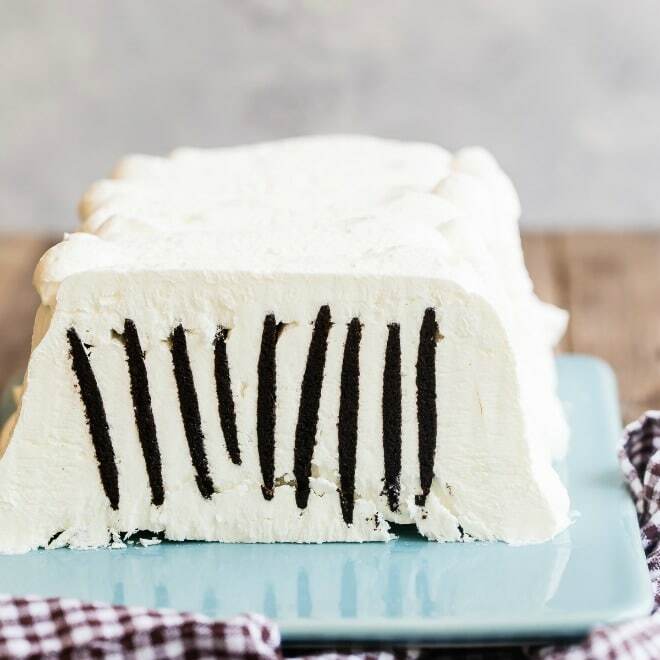 It may be a little softer than the whipped topping, but a few minutes in the freezer to firm it up before cutting is all it takes. Can you make Chocolate Eclair Cake with canned frosting? Yes, you can. Really, store bought chocolate frosting really works for this cake! I warm my tub of prepared frosting in the microwave for 20 seconds, stir, then spread. It spreads much easier. 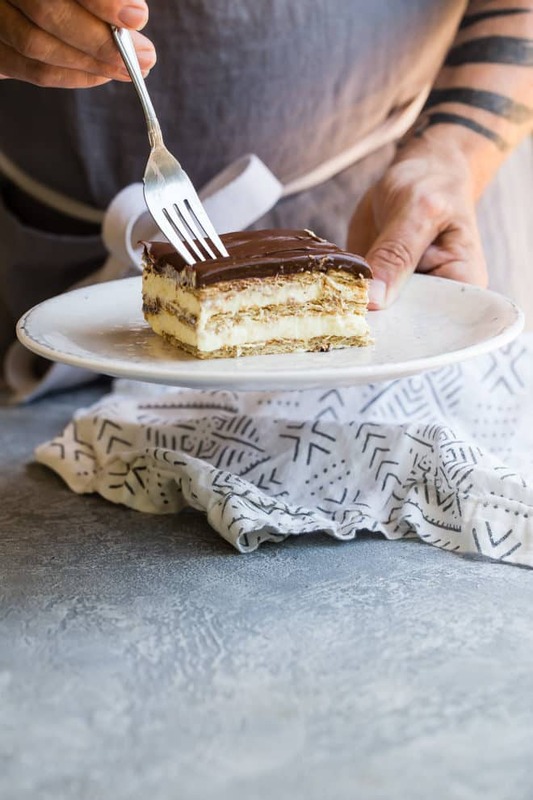 Can you make Chocolate Eclair Cake with ganache? I can’t think of anything more delicious than making your own thick ganache to pour over this graham crackers. If you prefer chocolate ganache instead of store-bought chocolate frosting, you’re in luck. You only need 3 ingredients to make a rich, silky-smooth ganache (recipe courtesy of Ina Garten). Combine all ingredients in a double-boiler and whisk until smooth. Pour while still warm over final layer and allow to cool. What are some Chocolate Eclair Cake variations? Sugar-free, low-fat Chocolate Eclair Cake: use low-fat graham crackers, sugar-free pudding with skim milk and fat-free cool whip. Chocolate Eclair Cake with peanut butter: Add 1 cup creamy peanut butter to the pudding and milk, and top the frosting with chopped roasted peanuts. Pistachio Chocolate Eclair Cake: Substitute pistachio pudding (who can resist that light green color?) and top the frosting with chopped pistachios. Chocolate Vanilla Eclair Cake: Substitute 1 box chocolate pudding and 1 box vanilla pudding. Prepare the two flavors separately and make the bottom layer chocolate pudding. Chocolate Eclair Cake with bananas: Substitute banana pudding and top the frosting with chopped banana chips or toasted walnuts. 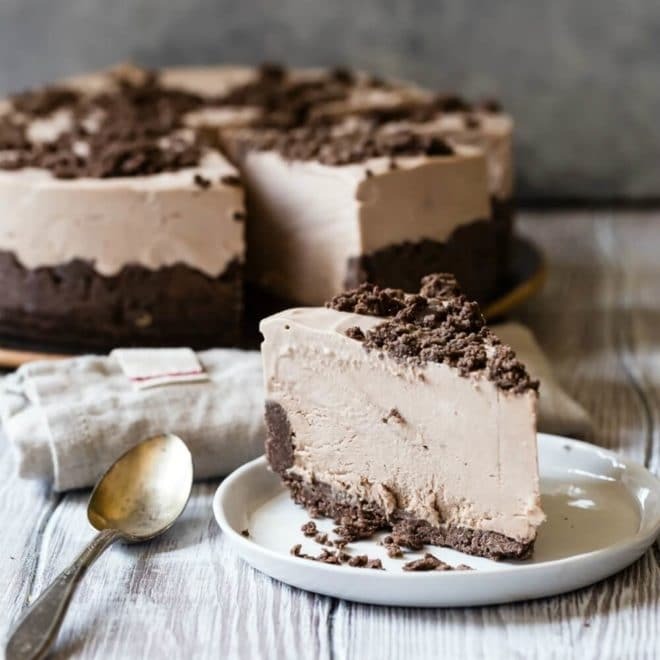 Gluten-free Chocolate Eclair Cake: Substitute gluten-free graham crackers for an easy gluten-free dessert everyone will adore. 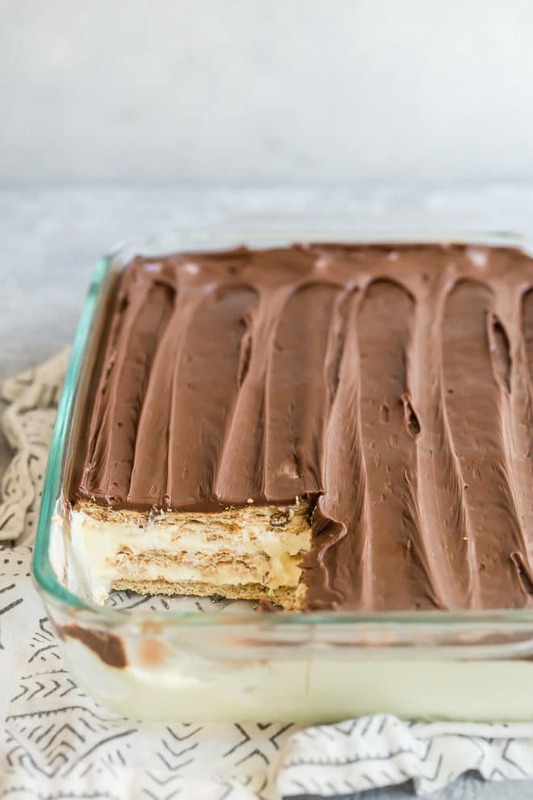 Chocolate Eclair Cake with saltines: Love that sweet/salty combo? Make this cake with Club crackers, saltines, or some other crispy, salty cracker. 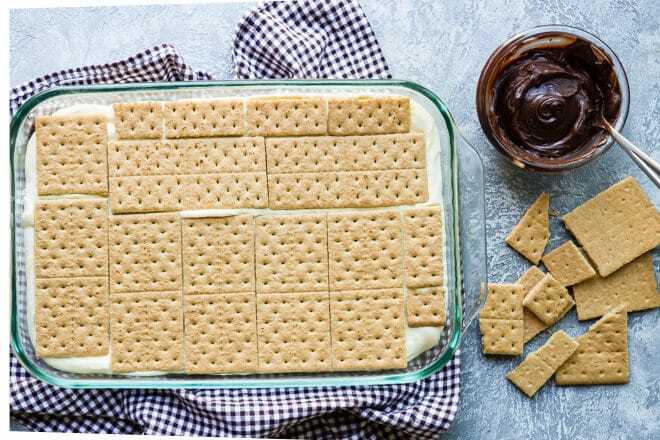 Chocolate Eclair Cake with vanilla wafers: Vanilla wafers stand in for graham crackers any day of the week. How far in advance do you make Chocolate Eclair Cake? Give this cake at least 8 hours, but those who have infinite amounts of patience make it 24 hours in advance. Good luck waiting! Can Chocolate Eclair Cake be frozen? If you’re aiming for picture-perfect cut squares of cake, it helps to freeze the cake before cutting. But if you need to freeze this cake, wrap it tightly in foil and store in a zip-top plastic bag to store in the freezer. It should keep well up to two months. Thaw the cake overnight in the refrigerator. In a medium bowl, whisk together pudding mix and milk until smooth. Fold in whipped topping. Line bottom of a 9-inch x 13-inch pan with a single layer of graham crackers, breaking some if necessary to fill the layer. Pour half the pudding mixture over the crackers and spread evenly. Top with another layer of crackers. Pour the remaining pudding mixture over the second layer of crackers and top with a third layer of crackers. Carefully spread the frosting over the top layer of graham crackers. Refrigerate at least 8 hours or overnight. Serve chilled and store any leftovers covered in the refrigerator. Thank you, it tastes WAY better than it looks! I hope you enjoy it. Desserts you make the night before are the best! This reminds me so much of growing up. 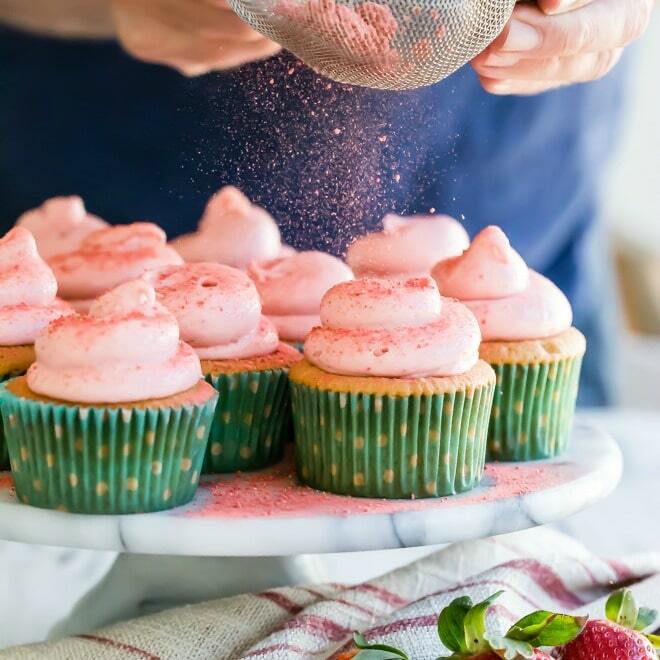 So yummy and easy! My goodness, Meggan, this is genius! The photos really do make it look like something you’ve slaved over, not pulled together in 10 minutes. This is most definitely up my alley! this was so good! i made it twice in the same weekend! thank you! I zap the frostingt for few seconds, easier to spread. I have never wanted anything as badly as this cake. I had one at my cousin’s birthday party in 1997 and I’ve been dreaming of it ever since. In fact it is the only thing I can remember from 1997. Thanks for sharing it. Hi Eva, sorry for the confusion! 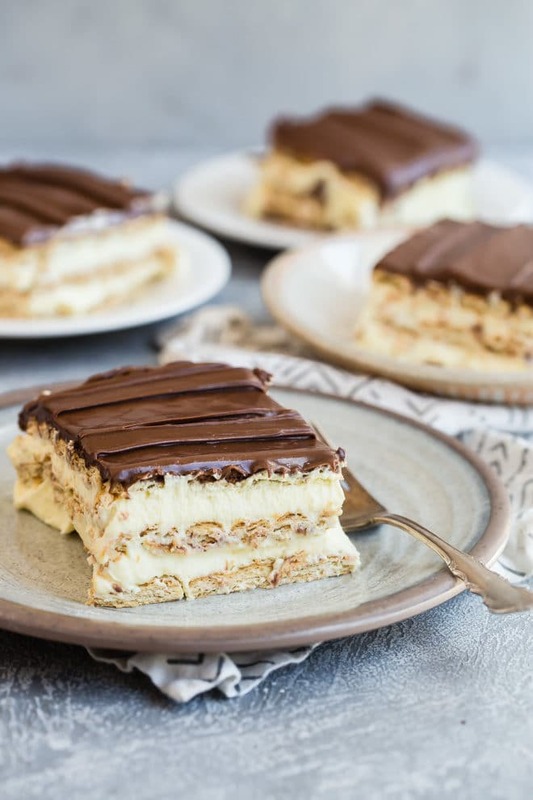 “Eclair Cake” is a THING in the Midwest, something everyone knows and loves, and it’s obviously not truly eclairs made into a cake (I’m well aware, having gone to culinary school, what an eclair is). I have to call it by this name so people on the internet, who are searching for chocolate eclair cake, find what they want. 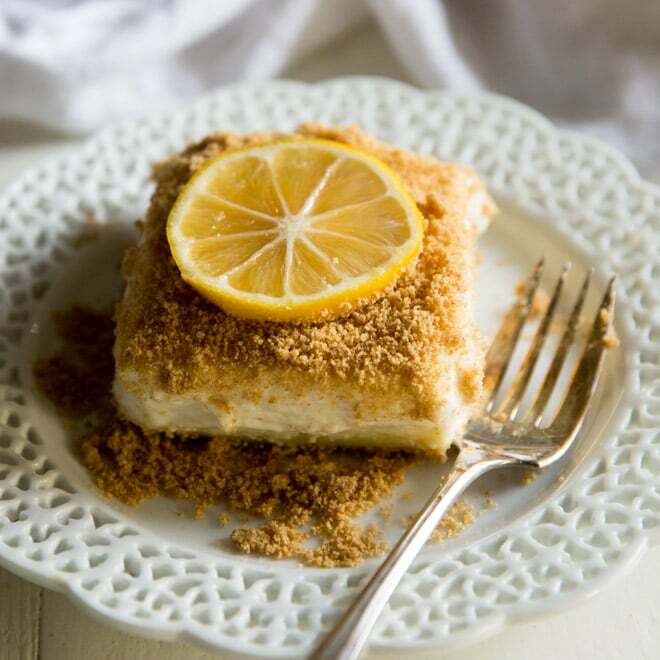 If I called it Graham Cracker Cake, no one in the Midwest would have any idea what I was talking about. It’s just a regional cake that I guess you have never heard of. Sorry about that.